Enable your next embedded project with FM broadcast ability. This small module packs some power. With a 2mW maximum broadcast power we’ve been able to transmit up to 60ft with a simple 31" piece of wire (¼ wave of 95MHz). 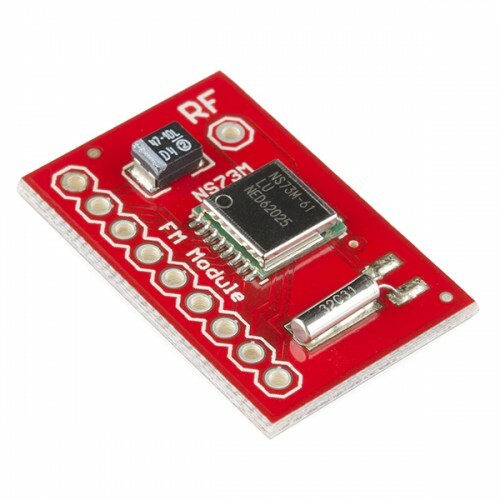 Built upon the NS73M module, it is digitally tune-able from 87MHz up to 108MHz. Right and left channels are available for stereo broadcast as well! This product is meant for research purposes and is not FCC certified. The NS73M part is not certified by itself (certification requires an antenna be attached) but has been used and certified in many consumer products. Note: An antenna is required. We’ve used a 31" piece of 22 gauge basic hook up wire with great results.